Conventional wisdom positions the Bedouins in southern Palestine and under Israeli military rule as victims or passive recipients. In The Naqab Bedouins, Mansour Nasasra rewrites this narrative, presenting them as active agents who, in defending their community and culture, have defied attempts at subjugation and control. The book challenges the notion of Bedouin docility under Israeli military rule and today, showing how they have contributed to shaping their own destiny. 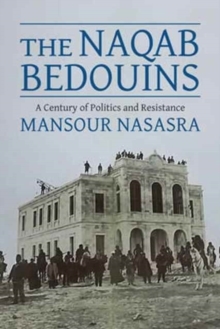 The Naqab Bedouins represents the first attempt to chronicle Bedouin history and politics across the last century, including the Ottoman era, the British Mandate, Israeli military rule, and the contemporary schema, and document its broader relevance to understanding state-minority relations in the region and beyond. Nasasra recounts the Naqab Bedouin history of political struggle and resistance to central authority. Nonviolent action and the strength of kin-based tribal organization helped the Bedouins assert land claims and call for the right of return to their historical villages. Through primary sources and oral history, including detailed interviews with local indigenous Bedouins and with Israeli and British officials, Nasasra shows how this Bedouin community survived strict state policies and military control and positioned itself as a political actor in the region.